This post is part of my developing series on the EveryYou concept– the ability we are developing to create a specific and targeted recommendation of one based on the unique combination of desires, needs and interests of each individual at any moment in time (first post here). “The presence of the Long Tail effect might be less universal than one may be led to believe." “product variety has been skyrocketing in the Internet age, and therefore more and more products can be left unnoticed by consumers, or are being discovered very slowly, even though the customer base is also expanding." This is exactly the point of the EveryYou principle adds value. The Long Tail is based on matching the unconstrained supply of the Internet to niche demand. 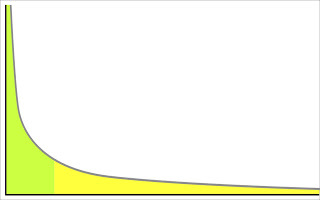 What is missing is that the niche demand in Long Tail theory is constrained because it depends on knowledge. That is, someone can only demand a niche product if they know about it and believe that they like it (or could like it). For unconstrained niche demand you need to have a systematic and automated means of making trusted and targeted recommendations to someone. This is the EveryYou principle. Using the four dimensions of data we now have on people interacting with our sites (breadth), the different things an individual does on a site (depth), the interrelation between the data we have one person and others (context) and the freely provided data we have unrelated to transactions (community) we can develop a specific and targeted recommendation of one based on the unique combination of desires, needs and interests of each individual at any moment in time. Without the recommendation part the tail is undiscoverable and therefore demand constrained. Through the EveryYou principle you don’t need to think about a head, body or tail as you can use technology and social change to target each recommendation and individual as a single, individuated marketing activity. At WheresURL.com, we have been addressing the problem by making the "where" & "what" of the Long Tail of Travel quick and easy to find. Looking for a Dude Ranch in Colorado, an Irish Pub in San Francisco, or a Childrens Museum in Connecticut? Choose the category and move the map anywhere to see what's around. Except for hotels, every place has only one location (no Starbucks or McDonalds), which are the truly local flavor of travel. This is a good read.There is a sweet spot in your argurment but 4 things mitigate against it in its current form at the moment. 1 Search patterns have changeed with processing power dramatically since 2005. In 2005 we were in the pre "widget" or "App" phase of distribution. So the value of the supporting data is limited. 2 From a behaviorist point of view, humans do tend to do what other humans do by instinct and a small number deliberatly dont do what the others do. Hence most people dont want to be different or "Nichey". We seek security in treading a well worn path on our travels. 3 The supply side distribution is effected by competance and the balance is A symetrical in favour of national & international brands. Niche suppliers in many cases offering a genuine travel experience lack technical competancy or the tech integrations required to supply to the major distribution partners. 4 Noise. The sheer volume of internet noise created by the major players drowns out many niche providers. Major players have huge connectivity, 1000s of key words and SEO pages often driven by marketing agencies working on Ad spend metrics based around rewarded targets and not client focused aquistion. Just when you think you have found a site that is expert you find it comes back to hotel club, Pegasus GTA blah, blah. That all said you have something prehaps the Aldi model supermarket stock and inventory model vs the Coles Woolies may offer us some insights into choice in mass markets. i'll just comment on this quote: "getting the people to find the thing they did not know they were looking for". the way i look at it, is that the long tail gives smaller, low budget operations a chance to get a start and on the radar. and if they create a product that people can't find anywhere else i.e. it appeals to the EveryYou and if there are enough EveryYou's showing interest, then that business starts to move up the tail towards the head. for example, i think twitter started off in the long tail, appealed to a few EveryYou's then bang - everyyou's and everyme's were draw in once a tipping point was reached. Where perceptive comments here. The very personalized which honors the four dimension of breadth, depth, context, community is moving in the direction to understand the every but a eminent American philosopher Ken Wilber has said that individual has 16 perspectives on a particular situation. it is based on AQAL Model which takes into account how the individual, collective, techno economic structures all interact dynamically. Your 4 dimensions in a sense map to 4 of the 16. Fascinating theory (EveryYou) and very interesting comments. Let me add my two cents (Canadian cents) if I may. What jumped out at me in your post was "One of their conclusions was that the challenge with internet distribution was not the supply side (making digital inventory available on the web) or the traffic side (bringing people to the web) but was the discovery side (getting the people to find the thing they did not know they were looking for)." I agree completely with this assertion. If I understand it correctly, the theory of EveryYou, would allow marketers (in this case travel marketers) to push product to an individual based on that individuals available digital data, similar to the way Google Reader recommends blogs based on the existing blogs the user is already following. I have "discovered" some great blogs this way. However, when it comes to travel (or new independent music artists, for example), an organization (be it hotelier, destination or restaurant) would need access to the individual's preferences at any given time (and this isue of any given time is key). ("For unconstrained niche demand you need to have a systematic and automated means of making trusted and targeted recommendations to someone.") Notwithstanding the technology available, I have strong doubts that most individual's data (save for actual purchase history) would be very reliable because, as you rightly point out - "human beings are a mess of contradictions." and preferences change over time and unless the individual constantly "updates" his or hers digital persona the automated system may end up recommending something totally irrelevant. "Using the four dimensions of data...we can develop a specific and targeted recommendation of one based on the unique combination of desires, needs and interests of each individual at any moment in time." In theory, this looks great and maybe with time there will be a digital service that can do this (my wish would be for a system whereby you ask a question as you would a human being and your "digital agent" would come back with the perfect answer/recommendaion). But even if the technology is there - what about trust and brand? In the era of "too much information" I think the brand becomes more important than ever. As a traveler and consumer, who can I trust to make impartial recommendations about products or travel? For example, speaking about hotels, I have been a Priority Club Ambassador member at IHG for a few years. I trust IHG brands over most other hotel brands. IHG must have quite a bit of data on me, but they could have more if they knew how to ask. For me to trust unknown hotels or B&B's or Villas in Tuscany I have to either a lot of online research or stumble upon a friend who's been there. The head of the tail is powerful because that's where we find the big brands. Some people believe advertising is dead or that you can do away with advertising by solely participating on social media (e.g. start a Facebook fan page). This clearly does not work (try building a fan base on Facebook when nobody knows you or about you). I don't believe advertising is dead and I don't believe that brand is dead. In order to break through the "too much information" and "too much choice" era, those who can advertise and advertise well are the ones who can breakthrough because, with few exceptions, the challenge of discovery can only be overcome with advertising. Of course, the more relevant and targetted the advertising the better (that's what I mean by advertise well). Hope all is well with you Tim. Unfortunately, I won't be able to attend PhoCusWright in Florida this year. If you go, have a great time. Maybe I'll go to ITB next year. I've just read it after following the link from today's blog post.